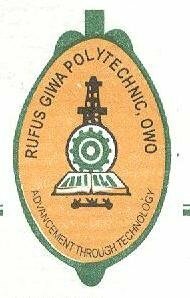 Rufus Giwa Polytechnic, Owo [RUGIPO] Full-Time National Diploma, ND Post-UTME Supplementary Admission Screening Form, Cut-Off Marks, Admission Requirements, Application Guidelines and Closing Date for 2018/2019 Academic Session. Latest Update: This is to inform all prospective candidates and sundry that the cut-off point of the Polytechnic is now one hundred and twenty (120) marks. Consequently, all interested candidates are free to apply for admission into the Polytechnic through the Portal of the Institution for its Post UTME. In addition, such candidates are enjoined to do change of Institution and also upload their O’level results on the JAMB CAPS for proper placement. Only candidates that scored 120 and above in the 2018 Unified Teritary Matriculation Examination (UTME) conducted by Joint Admissions and Matriculation Board (JAMB) are invited to apply and participate in the screening exercise. Admission into all full time ND programme is through the UTME, examination being handled by the Joint Admissions and Matriculation Board (JAMB). Candidates are to check the JAMB Brochure for the general entry requirements and as well take note of the specific course requirements with respect to Rufus Giwa Polytechnic, Owo. In addition, candidates must obtain five credits at WASC/GCE O'L/SSCE/NECO/ NABTEB at not more than two sittings.